Ainsley Harriott's Feel Good Cookbook - Food that makes you feel great! 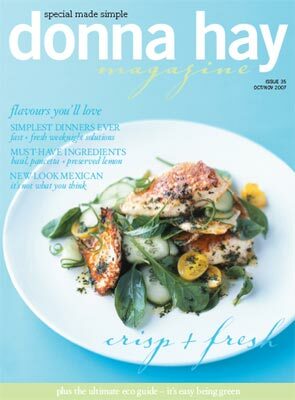 Donna Hay Magazine - The days are geting longer and the nights are crisp and fresh; it must be spring. "Salads are a great way to enjoy the seasonal flovours spring has to offer" says Donna. "By salad I mean a satisfying meal bursting with flavour not just a few leaves and a drizzle of dressing".From crunchy parmesan chicken tossed with baby spinach leaves to cumin-crusted lamb with chickpea salad, these recipes make great weeknight meals that will elevate your evey day food into something special. "Salads can be so much more than a humble side dish and they're so fast and easy to prepare. Fresh vegetables dressed up with grilled hoisin lamb or garlic pork drizzled with a tangy lemon or lime dressing, that's a dinner to look forward to". What are the flavours of spring? Spring is all about fresh, bold flavours like basil and lemon. Salad greens and vegetables like zucchini, asparagus, beans and sugar snap peas are all in season so take advantage of their lovely crunch and flavour. My favourite recipe at the moment is a crunchy Parmesan chicken salad with a simple basil and lemon dressing. The flavours are a winning combination for spring and it's simple to make for a weeknight dinner. Can a salad really be a meal in itself? If you want a satisfying salad for dinner you have to have a combination of textures and tastes, not just layers of leaves. I love salads with crunch so you can try adding chicken crumbed with couscous to your salad to give it a bit more bite or layering thin pieces of veal, crunchy potato and baby spinach as a fresh take on your meat and two veg dinner. The secret is to add substantial ingredients like roasted sweet potato, crisp bacon or big croutons to give your salad a real boost. What are you cooking this spring? I love the simple combination of Mexican flavours at the moment, spices, lime and chilli. Most people think Mexican food is all about taco shells and sour cream but the true flavours of Mexico are light and fresh. Try chilli marinated pork spare ribs with a fresh black eye bean and tomato salsa or a spicy fish taco served on a soft corn tortilla with a side of chilli lemon guacamole. You'll be surprised how easy great Mexican is too prepared. Is it true you harbour dreams of becoming a cheese maker? Absolutely, and I've finally been able to include a cheese making story in the latest issue of the magazine. It's so satisfying making your own cheese or yoghurt and it really isn't hard. I think it's important to take the time to do things like make your own fresh ricotta because it allows you to appreciate what real food is at its core. It's extremely satisfying, giving you a feeling of accomplishment as well as giving introducing you to a whole new food experience.